10% Student Discount Using Code 'GMSTUDENT'. To make a rental booking with Green Motion Leicester North, simply enter your rental location, time and driver’s age and click on ‘Search’ to browse our range. Green Motion Leicester North is located just outside of the city centre, on Melton Road and is easily accessible by all methods of transport. We are within 10 minutes driving distance from the city centre and 15 minutes driving distance from Leicester Railway Station. - For UK Driving Licences you are required to provide a DVLA check code which can be done online following this link. We are set just outside of the city centre, on Melton Road which is also known as the Golden Mile. Our rental station is located within a 15-minute drive from the Leicester Train Station and is easily accessible by foot and bus. In the cosmopolitan buzz of city life, Green Motion Leicester North provides customers with reassurance of a hassle-free driving experience with second to none choice of vehicles. We offer a delivery and collection service ensuring our rental vehicles are ready and available for the times where you need them the most. Green Motion Leicester North also offers premium and wedding car hire at highly competitive rates, you can browse our premium selection on our website. Vehicles are available for both short term and long term basis so whether it’s a short city break you’re after or a long-term substitute vehicle, we are the place to come. If this is your first time driving a car in Leicester, our advice is to stay calm, allow sufficient time for your journey and remember to drive on the left. To navigate around Leicester with ease, we recommend hiring a GPS (ask at the rental counter for details). Curve Theatre - Offering the best musicals, plays and drama Leicester has to offer. Most of the answers from the FAQs can be found within our terms and conditions page which can be found at greenmotion.co.uk/terms. We strongly recommend to look through our terms and conditions prior to your rental. However, if this does not answer your question or if you would like to speak to us directly, please feel free to contact us by phone or email, you can find our contact information below. How can I contact Green Motion Leicester North? Bookings can be made either online on our website or by calling the branch directly. To make a booking online, simply enter your pick-up and drop-off location, hire dates and driver’s age and click on ‘Search’ to browse our range of hire options. What forms of identification do I need to hire a car? Do I need to leave a deposit and how much will that be? In all cases the main driver will be required to leave a deposit which will be taken by the method of pre-authorisation from the credit card presented. Deposits can vary depending on the type of vehicle, driver’s age and driving experience. This can range from approximately £200 - £2505. Can someone else's card be used for security purposes? For security, we can only accept deposits from a card held in the main driver’s name. How long does it take to release my deposit? Green Motion Leicester North processes a deposit payment which is a block of the agreed amount held against the credit card. Upon return, the vehicle is thoroughly checked and once happy with the condition, only then is the deposit released. Deposits generally take 7-14 days from the return date. If after this period, you believe the deposit has not been released, please contact your issuing bank as Green Motion Leicester has no jurisdiction in this matter. Can I rent a specific car or van? Does the vehicle have an excess and can this be reduced? Do you offer out of hours service? Any out of hour’s requests are treated as on request and cannot be guaranteed. Fees may vary, please contact the branch for more information. The minimum age is 21 years old. Any drivers aged 21-24 years will incur a daily young drivers surcharge and restrictions may apply. Am I able to return my hired vehicle earlier than scheduled? Vehicles can be returned earlier than scheduled during normal business hours at no additional cost. Any early returns or unused rental days are non-refundable. How do I raise a complaint with Green Motion Leicester North? We always strive to provide exceptional customer service and aim to deal with any queries within 5 working days. Complaints need to be sent to [email protected] within 30 days of returning the vehicle. Complaints made after this period, will not be considered. Leicester is a uniquely diverse city and a great place to visit. The city is culturally diverse and combines traditional English customs with its large Asian population. Looking for a bit of Asian flavour? Take a stroll down Belgrave Road - also called the 'Golden Mile' - where you will find colourful displays of Indian culture in almost every shop window, from gold jewellery to silks and sweats, Belgrave Road has made a name for itself. Feeling hungry? With restaurants galore, you are bound to find the perfect curry, biryani or dosa! Leicester also has a great nightlife with an exciting mix of clubs, music and comedy venues! Are you ready to pack your bags and spend a few days in Leicester yet? 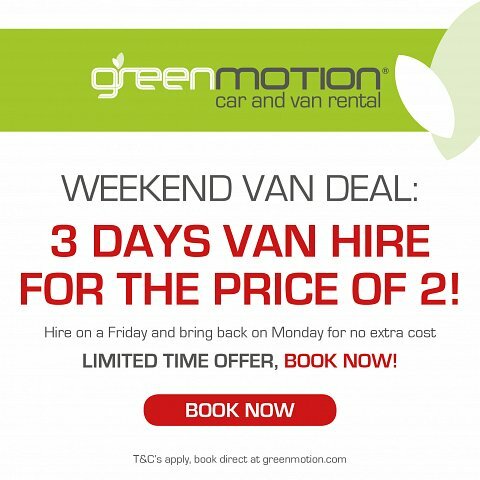 Book with Green Motion Leicester North today!